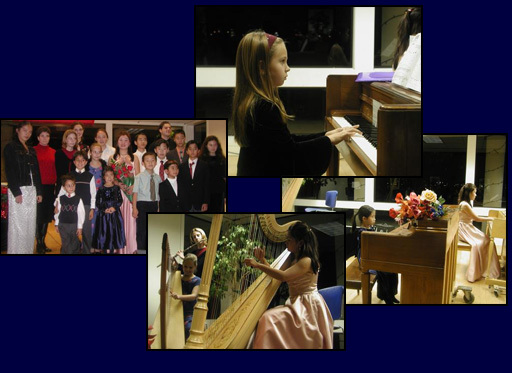 The San Jose/Evergreen Piano & Harp Music Center has become one of the most reputable music schools in the San Francisco Bay Area. Ms. Mei, our Music Director, is an excellent teacher and performer. Ms. Mei holds a Masters Degree from the Manhattan Music School, a world renowned music institute. She is known as a skilled concert pianist and reputable music instructor throughout the San Francisco Bay Area. Our students include all ages and all levels of ability. Through the love of music, they are learning to express their feelings by mastering their instrument. We offer classes for the piano, harp, guzheng (Chinese zither) and pipa. See our fee schedule, or contact us to learn more. If you're looking for a piano, see our links page for sales and rentals.